Kplan is an Information Management Software which helps you organize your all your information. KPLAN PERSONAL is the ideal companion, powerfull and fast to manage and organize your information. 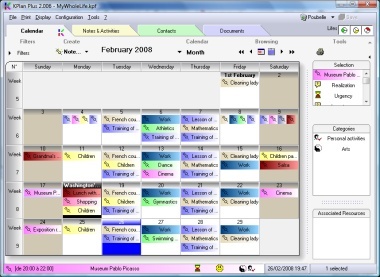 KPLAN integrates an Information Manager, a Time Manager (Agenda + Organizer) and a Resource Linker which associates different resources (individuals, companies, documents). Help us build the largest freeware directory of free software downloads by submitting your downloadable freeware today. Find more listings like Kplan Personal by browsing the freeware category Personal Information Managers.